I haven’t made doughnuts in forever. In my first year of blogging I was making them left and right, but as of late my doughnut pan has been collecting dust. There’s no good reason for it, I just hadn’t really thought about it. Until now…and oh, what a comeback. 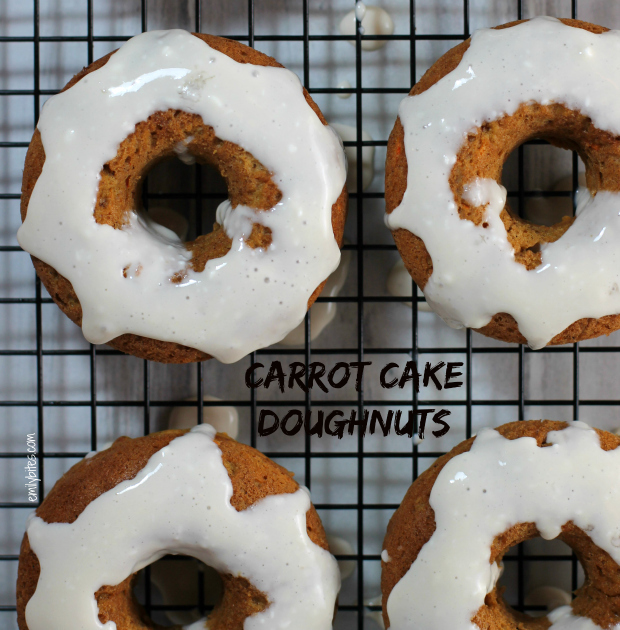 These Carrot Cake Doughnuts are hands down the best doughnuts I’ve made to date. I’m so proud of them! They are light, yet filling, and the maple flavored cream cheese glaze adds the perfect amount of sweetness. I’m swooning. If you don’t own a doughnut pan, I use this one (affiliate link) you can order from Amazon. They’re also carried in lots of different housewares stores. 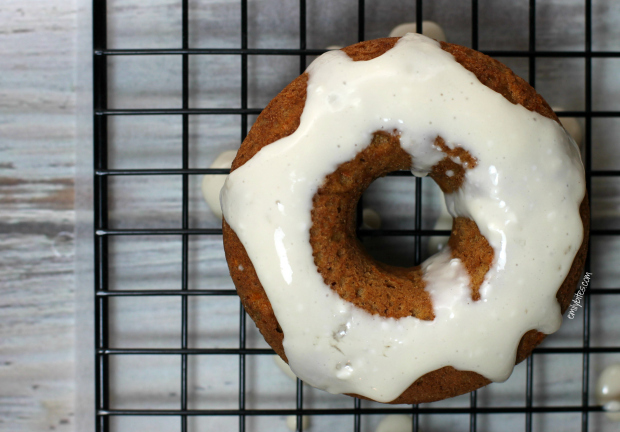 It’s pretty much worth buying one just for this recipe (seriously), but I also have recipes for Lemon Poppyseed Doughnuts, Chocolate Frosted Doughnuts, Spice Doughnuts, Peanut Butter & Jelly Doughnuts and Strawberry Doughnuts. It’s easy to just stir some ingredients together and pop them into your doughnut pan, and so much healthier than buying the deep fried kind at a donut shop. 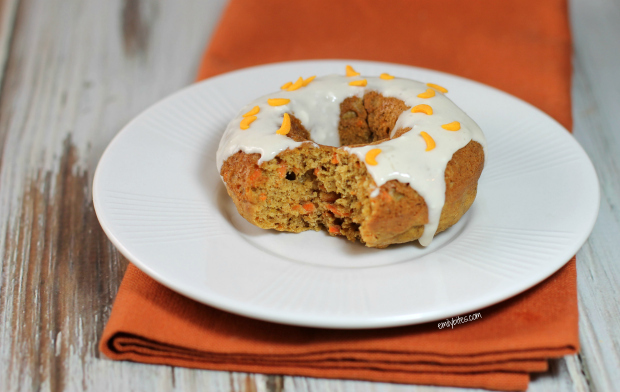 These Carrot Cake Doughnuts would be a perfect addition to an Easter brunch, but they’re also just a fabulous recipe for a family breakfast or to make ahead for a grab and go morning meal all week long. Be sure to refrigerate any leftovers because of the cream cheese glaze. No matter who you serve them to, I promise these are going to be a big hit. Preheat the oven to 350. Lightly mist a 6 cup doughnut pan with cooking spray. In a large bowl, stir together the flour, baking powder, baking soda, salt, cinnamon, nutmeg, cloves and brown sugar until well combined. In a medium bowl, beat the egg and then add the carrots, oil, applesauce, ½ teaspoon of the vanilla and ¼ cup of milk. Stir until well combined and then add to the dry ingredients from step 2. Mix until well combined. Spoon the mixture evenly into the 6 prepared slots of the doughnut pan. Bake for 15 minutes until an inserted toothpick comes out clean. Flip the pan to release the doughnuts onto a cooling rack and allow the doughnuts to cool. In a medium bowl, combine the remaining ¼ teaspoon vanilla and 2 teaspoons milk and add the cream cheese, syrup and powdered sugar. Using a hand mixer, mix until well combined. 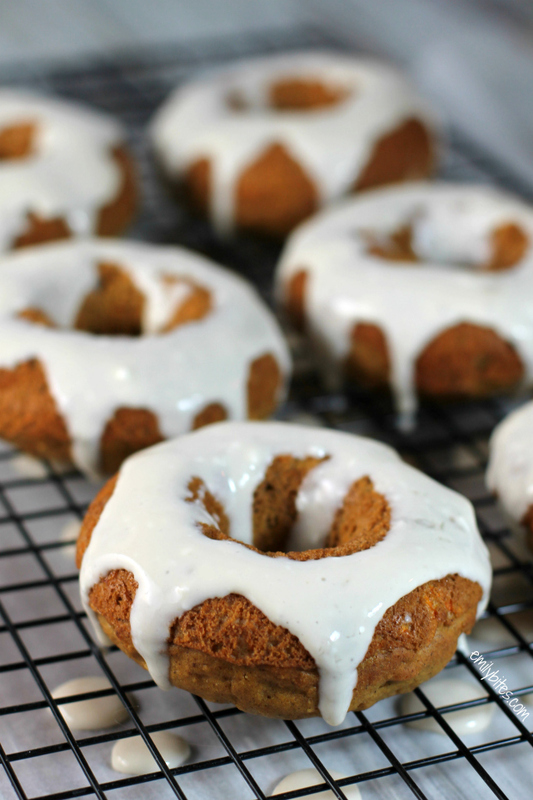 When doughnuts are cooled, spoon the cream cheese glaze over top. Carrot cake and cream cheese is my favorite! Brilliant to make it into a doughnut! I’ve made lots of muffins, but never donuts. Is the batter just the same? Probably a silly question – do you just pour it into the donut pan like with muffins? p.s. Agree with Liz. These look fabulous. I made these yesterday, and they were delicious! We recently purchased a mini-bundt pan at a thrift store, and these worked great in that pan. Yummy still warm-from-the-pan for breakfast, great that evening for dessert. And best of all, made entirely with ingredients we already had, no shopping necessary! These will definitely be on my list of recipes to make! I have a mini-doughnut maker which are even better for portion control. So far, I’ve made pumpkin and cinnamon sugar…can’t wait to try these! Nope, never used pineapple. Hope they were a hit! I made these following the recipe, except used full fat cream cheese and real maple syrup. This only added a few calories and they were delicious! Can’t wait to try some of the other doughnut recipes suggested. 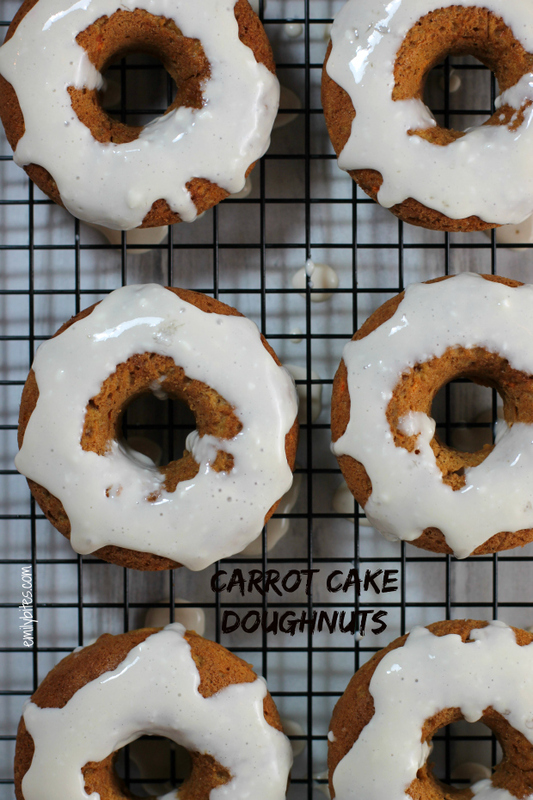 Just made the carrot cake doughnuts and they were DELICIOUS! Even my husband who is a muffin nut, really enjoyed them. Just discovered your web site Emily and I love it. Thanks. I have a mini donut maker, so I’m trying to figure out how many donuts would be 5 pts? Maybe 2 or 3? Do you have any idea? Sorry Jen, I’m really not sure since I don’t know how big the minis are. You’ll probably just have to see how many it makes and then run it through the recipe builder. I hope you love them! These are just so, so good. I make them every few weeks and they’re all gone within a day or two…my husband, 2 year old and myself can’t keep our hands off! Yum! Just tried these with shredded apple instead of carrots…delicious! I know it’s healthy for you, but I’m not a big fan of wheat bread. How does white whole wheat flour make your breads taste, and if I use all-purpose instead; does it change the points value? I’m so excited to try your recipes.